Waterfalls are a beautiful addition to any pond. The sound of splashing water is amazingly relaxing. Waterfalls add oxygen to the water and provide a large area for beneficial bacteria to grow on. Don’t over do it. Often, people try to create too large a waterfall. If your ground is flat, your waterfall should only be two to three feet tall. 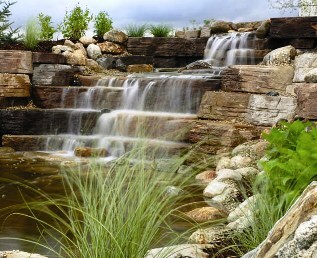 If your ground has a natural slope to it, you can build a much larger waterfall and still have it look good. Ponds and waterfalls need to be as natural as possible. A six foot waterfall located in a flat yard will look out of place. Try to blend your pond into the surrounding landscape. Don’t build your waterfall and/or stream too narrow or straight. Again, make your stream look natural by creating twists and turns and by using different sizes of rocks. Often people stack flat stones on top of each other in a straight row. This creates a “chimney” look and very seldom looks natural. A separate piece of liner is typically used for the waterfall/stream. This liner does not need to be glued to the pond liner as long as the joint overlap is running downhill. Be sure the stream liner is over the pond liner. Expanding foam is a must. Traditionally people use mortar to secure their rocks. Instead, we have found that expanding foam works better and lasts longer.